This is a beautiful in-town Breckenridge home that is located on 3/4 acre, has a big yard with lots of trees and the best views in all of Breckenridge. You can walk to everything that Breckenridge has to offer - the ski area, restaurants, bars, shopping - but still have privacy and peace. Our home's almost two homes in one. There are two master suites, one above the kitchen and one off the living room. Then there's two further bedrooms below the kitchen, one en-suite and one with a bathroom across the hall. Finally there's a semi self-contained apartment, with two further bedrooms, two bathrooms, and its own kitchen and living areas. The kitchen's just been remodeled and now has a 48" Wolf dual fuel range, french door Samsung refrigerator, farmhouse sink, island with prep sink and amazing 20' wide panoramic glass doors to the deck. There's a custom Colorado-flag design dining table, a well-stocked pantry and a powder room tucked in the corner. The main living room has two separate seating areas, a 55" 4K curved TV, a foosball table, a telescope for checking out the stars (or the ski area), an upright Steinway piano and a bookshelf stocked with entertainment for all ages. It's got cathedral ceilings, masses of windows and fantastic ski-area views. The deck has an 8-seater hot tub, again with amazing mountain views, which is a great place to relax after a hard day on the slopes. There is a top end Weber Summit S-670 natural gas grill (no more running out of propane ten minutes before the food's ready) and seating for 10+. The two master suites each have king-size beds and en-suite bathrooms with jacuzzi tubs. They both have their own staircases leading up to them for privacy and, large, west-facing windows looking directly out over the ski area. We never tire of the ever-changing vista. There's a semi self-contained two bedroom apartment below the living room. It has its own kitchen and living area, a second large-screen TV and a large, sectional, sleeper sofa. One of the bedrooms is en-suite, and there's a second bathroom off the living area. Of the bedrooms below the kitchen, one bedroom is en-suite with a bath tub and a shower system. It has a twin over queen bed. The other bedroom has a queen bed and a bathroom with a shower right opposite. To top it all off, there's a laundry with a top-end washer and dryer, cabinetry and office space, two mud rooms for ski gear, parking for several cars and a heated garage. We made the decision to move to Breckenridge permanently in 2014, having spent several winters here. Our children go to the local schools, and we run a small telecoms business in the town. We're originally from Europe - Dave's English and Marina's Greek - so we spend a lot of vacation time over there, and make our home available to others while we're gone. We chose this home for its size and location - it's a short walk to everything that Breckenridge has to offer whilst being just enough out of the way to be quiet and private. We love the deck. It's huge, and has amazing view of the ski area - it's exactly the right place to take a soak in the hot tub while watching the sun set after a hard day on the slopes. Less than five minutes walk to Main Street, with the excellent restaurants of Ridge Street closer still. Amazing views of the Breckenridge ski area from the two master suites, the living room, the kitchen and from the hot tub on the deck. Underfloor radiant heat throughout which is incredibly comfortable. Park in our heated garage - if you've not tried one before, you'll never want to go back! 2 Espresso automatic grinding Coffee Machines. Fully stocked pantry with almost any spice and herb you could imagine. 4 counter stool seating in the Main Kitchen. 8 Seatings on the big dining table and 6 on the apartment table. Unfortunately our home would be challenging for wheelchair users. There's an 8-seater hot tub on the deck, in a sheltered location with spectacular views of the ski area. Amazing house, close to mountain, excellent service! Such a wonderful house for a group of 11. The kitchen/dining area is massive and perfect for big family dinners. The separate but connected living room is amazing to allow different activities without it getting too loud. Bedrooms are all above or below the main floor, so they stay pretty quiet if others are still up late. 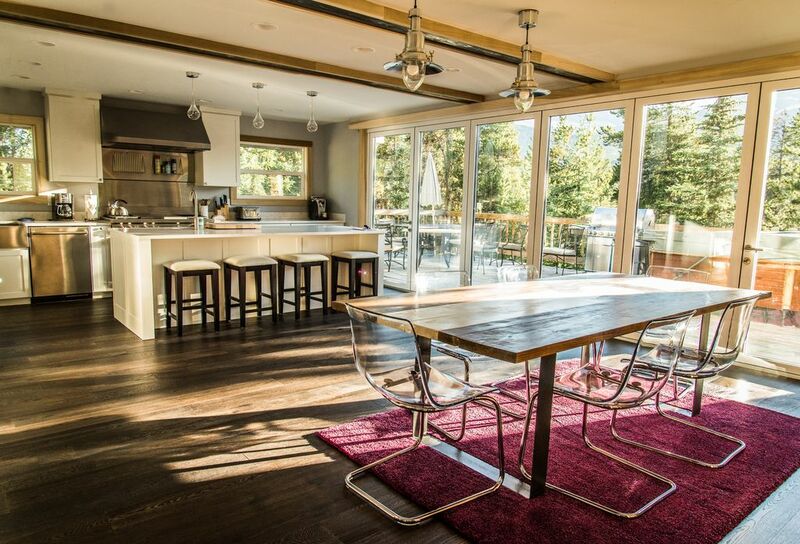 Overall, tons of room, great amenities, and super close to the gondola for easy ski access. Would 100% stay again! Large house with fully equipped restaurant style kitchen! Glass door wall opens up to large patio area, ideal for parties and entertaining! Our stay was amazing. We had more than enough room for 3 couples, 4 teenagers, and 2 young boys! The views were incredible, and walking distance from everything! This is a great home. It is very well appointed, close to downtown (4 blocks, easy walk down the hill). Walk-able to grocery store, dinner, Breck Gondola, etc. Also, the home has tons of toys for small kids, lots of room to spread out a large group, plus great views of the mountains. I would stay here again without hesitation. This is a great home for a family reunion or large group getaway - has everything you need and more! Perfect location - with a short walk to main street for shopping and restaurants. Highly recommend!